Our new G4 Mini Tower LED works great in tube lights, small reading lights, pendant lights, and glass wall sconces where a tiny G4 is required. It projects light in all directions similar to an incandescent filament bulb. It features 15 mini-SMD LEDs, so it puts out a massive amount of light in a 360° pattern. 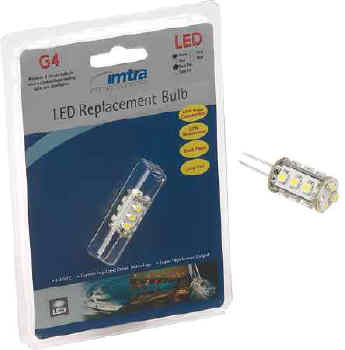 Very popular in newer Beneteau's and custom yachts with tube-shaped swiveling reading lights. Proprietary PWM Constant-Current chipset results in high performance across the entire 8-30VDC range.